Frederica Wilson seems like a nice lady. 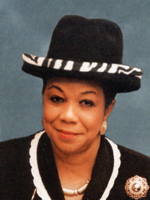 I mean, come on: Who cannot like a state senator who wears a hat like that for her official photo? Sen. Wilson has some admirable bills in this year’s session, too. She’s a former teacher and big champion of their causes. She’s compassionate about the woes of the homeless. Hell, she even wants to make sure inmates have condoms so they don’t contract HIV in the clink. Whether you are liberal or conservative, agree or disagree, you have to admit her heart seems in the right place with those type of bills. But then there’s her repeated attempts to pass a bill like SB 74, a law that would prohibit the term “illegal alien” in any state documents. Illegal immigration is definitely a hot topic in this country. Intelligent people have made strong arguments against and in defense of the issue. By the same token, ignorant people have used the controversy as a wedge issue. No matter your political persuasions, you cannot argue that the vast majority of people coming into this country illegally are good, hard-working individuals who just want a better life. It’s also hard to argue against how much strain they put on certain communities. So with an issue so complex, so deserving of intelligent debate, Sen. Wilson wants to argue about the words we use to describe them? Illegal alien or undocumented worker — it may be semantics, but there’s a reason why it’s used officially both at the state and federal level. Exhibit A: The dictionary. Illegal. adjective. 1. Forbidden by law or statute. Alien. noun. 1. resident born in or belonging to another country who has not acquired citizenship by naturalization. Undocumented worker sounds real nice, but it’s not entirely accurate. What if the person crossing over is the wife of a factory worker with a 2-month-old child who plans to become a stay-at-home mom? That woman could not be considered a worker, right? And what if they do have documents, but the papers are fake? Undocumented worker is a noun meant to elicit political support. But that’s hardly a reason to put it on official documents. I understand Wilson’s argument: How can you call people illegal and children aliens? But with all the other woes in our state, politicians’ priorities should be on fixing these problems, not legislating political correctness. Is that a Stetson with zebra trim? Hot damn!